If you have checked the website, you could notice that there is a lot of information/data collected for each coin or token. Wonder how it all works? Keep reading. It is easy to understand the problems surrounding the cryptocurrency niche. From a large number of digital coins and tokens to the tech involved, the problems they solve, spotting scams or dead projects to choosing a portfolio that fits your investment profile, the need for tools to face these issues becomes self-evident. Markets: How many exchanges and platforms are there to trade this asset? This information is important because it helps you not only find out how liquid is a coin (in terms of ease of trading it and combined with volume ratio) but also because, over time, the addition to certain exchanges is considered a status symbol and lends credibility to the token. Volume Ratio: How actively this asset is being traded on the exchanges? An all-important measure in every financial market, volume helps determine how big a pool of investors and traders deal in it in any given time period, which is usually a sign of a healthy, liquid environment. Spikes in volume also help identify events that may have happened referring to it or the market itself. Market Cap: This is the total cost of all coins available. Despite the fact that many believe this factor doesn't tell the whole story about price, it is indeed a useful indicator, showing you the size of the project when compared to its competitors or to the entire market itself. Whether it is a mature entity or a new startup, with the risks and rewards associated with each stage of the cryptocurrency. 24h Change: Is the price going up or down? Useful visual indicator for short-term moves which will prompt an investor to investigate if any recent news has affected price action in the aforementioned time period. Social Following: How many users are following the coin on the social media networks? Nowadays, social media has completely redefined the way any entity, be it an individual, a company, a nonprofit foundation or a cause, is viewed and followed by the public. It has achieved such an important status by bringing metrics into the equation, allowing everyone to see how big of an impact is being made. Social activity, allows an investor to gauge how much of an interest is being shown by the market or any part of it and it can definitely not be counted out when analyzing a digital currency. Google Trends: How many users are searching for the coin? With the big G being the point of reference in internet search, it is somewhat inevitable that it appears as a factor. Searches do not only show numbers and help gauge interest; they also work as a magnet in themselves. As more people search for a term or phrase, the information is picked up by various forms of media, marketers and other actors in the ecosystem, augmenting the effect of the search itself. By adding Trends as a factor, investors get an ever deeper sense of what is being talked about around internet. An excellent pair to social media activity if ever there was one. The crypto analysis tool also gives a figure for potential profit. The tech behind the curtains analyzes each currency for historical price data and searches for possible patterns, showing possible future price points and the potential profits based on current rate. The safety ranking formula is constantly updated and new factors will be added over time to improve it. 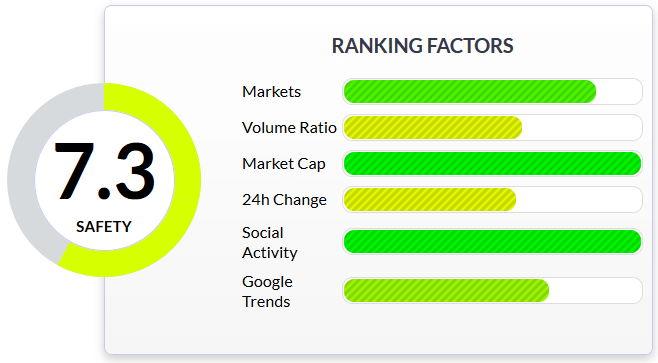 Each factor has a weight in the final rank that may change depending on market circumstances. While we strive to make the tool as precise as possible, bear in mind Cointobuy is only an informational tool and should not be used to make investment decisions. See our disclaimer for more information.